OTL. This recap of episode 4 is so so late, but I hope you guys are forgiving and understanding. I think it’s pretty clear that I have a hard time following this drama because I’m just not that invested in it (sometimes I even wonder why I recapped this drama in the first place), hence, why I haven’t posted my thoughts on the recaps for this drama like how I usually do for the recaps on my other dramas, but recaps are recaps and once I start a recap on a drama, I gotta finish it regardless of whether the drama interests me or not. Luckily, this episode picked things up and got things going. Here’s to hoping that it’ll maintain this momentum throughout the drama from this point on. From where we left off in episode three, Crown Prince Sohyeon gave Dal Hyang his first mission as a military officer: to find Mi-ryeong and bring her back to the Crown Prince. 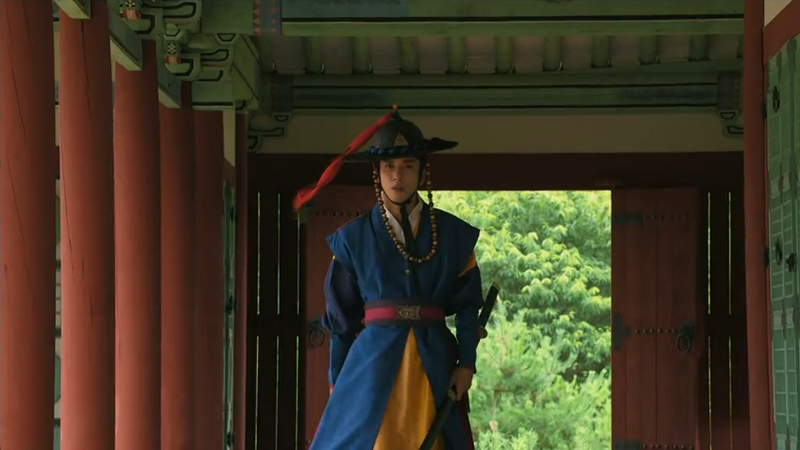 But Dal Hyang feels a bit iffy on this mission and questions Sohyeon’s intentions. How does this task have anything to do with protecting the country? Sohyeon tells Dal Hyang to just simply follow any order that he is given no matter what it is since he is now a military officer and also explains that he assigned Dal Hyang the mission not because he trusted him, but because he wanted to use this as a test to see if he could trust Dal Hyang. With that, Dal Hyang asks no further questions and Sohyeon leaves Dal Hyang’s house quietly. Princess Yoon Seo is having some tea with her mother in her bedroom when her mother hands her two talisman that will supposedly help Yoon Seo and Sohyeon give birth to a son. As the princess, this is Yoon Seo’s responsibility and if she does not give birth to a son that will be the heir to the crown one day, people will only look down on her. Yoon Seo is hesitant at first, but eventually accepts the two talisman that are for both her and her husband after listening to all that her mother has to say. Panic arouses when Sohyeon returns from Dal Hyang’s house. It turns out that Yoon Seo is in Sohyeon’s bedroom, trying to find a good place to sneak the talisman in and to hide it somewhere safe. Dal Hyang quickly becomes aware of the suspicious situation and hurries to his bedroom only to find Yoon Seo in front of his bedroom door after having no luck in escaping. He asks her about the piece of paper she has in her hand but when Yoon Seo refuses to give any answers, he follows after Yoon Seo who begins to retreat back into his bedroom (OMG THIS SCENE IS MY FAVORITE SO FAR OUT OF ALL THE SCENES IN ALL 4 EPISODES. THE SEXUAL TENSION IS BLAZING HOT!). She eventually loses her balance and falls onto the ground only to find a fallen Sohyeon laying on top of her (OMMGGGG). He starts to lean in towards Yoon Seo so Yoon Seo closes her eyes thinking that she’s going to finally get a kiss from her husband, but what she gets instead is the talisman from her hand stolen from Sohyeon who used the kissing as a tactic to trick her so that he could steal the talisman (oh ho ho, sneaky Sohyeon. Sneaky). Yoon Seo ends up explaining to Sohyeon about the talisman, feeling embarrassed and ashamed, but Sohyeon quickly defends her. He is the reason as to why things are the way they are right now and reassures her that he’ll think about the idea of having a family and its possibility (Me right now: PLEASE MAKE IT HAPPEN!). He returns to her the talisman before permitting her to leave his bedroom. Yoon Seo rejoices with her servant over how Sohyeon was laying on top of Yoon Seo (omg, how do I make this sound not as awkward? Okay, so basically a few servants went inside Sohyeon’s bedroom when he was on top of Yoon Seo and concluded that they were making love when really they weren’t) and asks her servant to relay the great message to her mom if her mom ever asks. She then goes on to open her drawer to look for something, but when she is unable to find the item that she is desperately searching for, she starts to panic and grow scared. Our two body guards, Seung-po and Min-seo, finds themselves worn out after a whole night of fun. Two maids stare at Min-seo’s beautiful face (I don’t blame them) while he’s asleep and one even gathers the courage to lean in for a kiss, but luckily, Min-seo wakes up just in time before she could do so. He heads to the washroom to go wash himself while Seung-po is still dead asleep in the room. Lol. Once news of Min-seo washing himself is heard, the news starts to spread around rapidly and becomes very popular among the maids. They all hurry over to the washing room to catch a glimpse of Min-seo washing himself. Seung-po finally wakes up, witnesses the commotion, and then follows the maids to see what they’re all up to. Of course, it turns out to be just them sneaking glimpses and looks at Min-seo’s body (which they seem to enjoy I might say. There are even ladies on top of the roof. LOL. Too dedicated). It’s not too long until Seung-po reveals the hidden ladies to Min-seo who freaks out upon seeing a whole bunch of maids run out of no where and away. Haha, too funny. Pan Se shows up at Seung-po’s service thinking that he is still Seung-po’s servant when instead he gets dragged to Dal Hyang’s house by Seung-po himself (poor Pan Se!). Pan Se is officially Dal Hyang’s servant now so that should be settled. Seung-po goes on to ask Dal Hyang if he’s attending the training camp for that day, but Dal Hyang answers that he has to go to Mohwaguan since he is assigned to Youngjubdogam which is the department that welcomes the envoys. Of course Dal Hyang stops talking when he recalls his conversation with Sohyeon who demanded that the talk between them two remain between the two. He quickly changes the subject and asks Seung-po about the prince and what kind of person he is to which Seung-po answers: “a crazy person.” Hahaha. He ends the discussion by expressing pity for the Princess who has to put up with a crazy man like Sohyeon. Haha. Meanwhile, back at Dal Hyang’s house, his two parents receive news of Dal Hyang’s military service examination and how he had passed the test! They exclaim and rejoice over the news and at the sight of his name on the list of men who passed the exam. His parents are in disbelief and surprise and begin to cry (aw, this scene is so touching). While we see his two parents rejoicing, we hear Dal Hyang speak in voice-over in a letter to his parents about how they probably heard about his results and about his new servant, Pan Se who, although is very honest, is also very fast and someone who rarely makes mistakes. Cue some dramatic music and you get a very dramatic scene of Dal Hyang putting on his military officer uniform (oh ho ho, we are finally getting started!). The voice-over continues as Dal Hyang vows to his parents that he’ll become the best military officer he can be and will do whatever he can to protect the country. Woot woot! Go Park Dal Hyang! He arrives at Mohwaguan since he is assigned to Youngjubdogam and awaits the arrival of the Manchus. Upon their arrival, the welcoming is intense and suspenseful as threats by the Manchus and Joseon people are made against one another. The military officers are called upon to prevent any upheaval and that’s when Dal Hyang catches sight of Mi-ryeong who is traveling with the Manchus. She smirks upon seeing Dal Hyang and takes notice of his appearance. 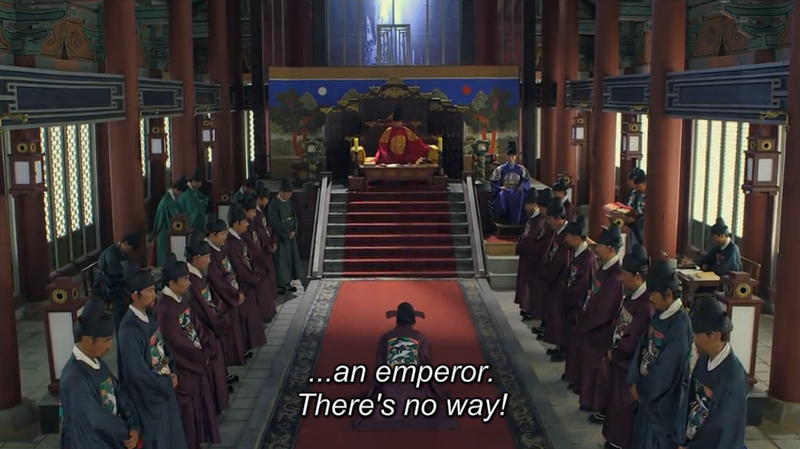 Meanwhile, back at the Palace, a group of ministers beg outside of the meeting room for the King to not welcome the Manchus, especially since they want him to bow down to General Yong Gol Dae (which will acknowledge him as an emperor and Joseon being subordinate to the Manchus). The King listens to all of this inside of the meeting room and grows conflicted as to what to do. The ministers inside of the room put forth their own thoughts and opinions as well which makes it all the more even more difficult for the King to reach a decision. In the end, he finally makes up his mind though and decides that he will greet Yong Gol Dae, surprising those that had opposed the idea. King tells them to get the party ready (oh damn, this is gonna be good). General Yong Gol Dae is in a meeting with one of the ministers and demands that the King come to greet him, not the other way around. If the King does not do so, he will depart for home (which isn’t good because then Joseon and the Qing dynasty might enter a war). The minister reports this to the King which causes even more commotion and chaos within the meeting room. The King grows exhausted and stressed and requests to take a break after all the arguing and debating. He demands everyone to leave except for Sohyeon who he has a talk with. Sohyeon remains neutral throughout all of this, hence why he didn’t speak a word at the meeting, but the King is paranoid about something else. He worries for himself and believes that the ministers aren’t really arguing over the country’s safety. Instead, they’re just fighting for their own power and authority. Sohyeon gives some much needed encouragement to his dad and offers some choices as to what they should do, but Dad has it all figured out. They’re gonna go to Mohwaguan to greet the Manchus. Final decision. While the King prepares to go visit the Manchus, they learn themselves that the King has made the decision to come greet them. General Yong Gol Dae is a bit suspicious that the decision was made faster than he had expected, but he brushes it off. He and the Vice General exits their motel room to meet someone else, not knowing that Dal Hyang is hiding in the same exact room. Once the two men leave, Dal Hyang heads straight to the desk in the room to read the journal that General Yong Gol Dae had been writing in to record the details of their journey to Joseon so far. In the journal, General Yong Gol Dae takes down notes of meeting Mi-ryeong who he suspects is a double spy and who he had listed as the Vice General’s wife so she could travel with them to Joseon. 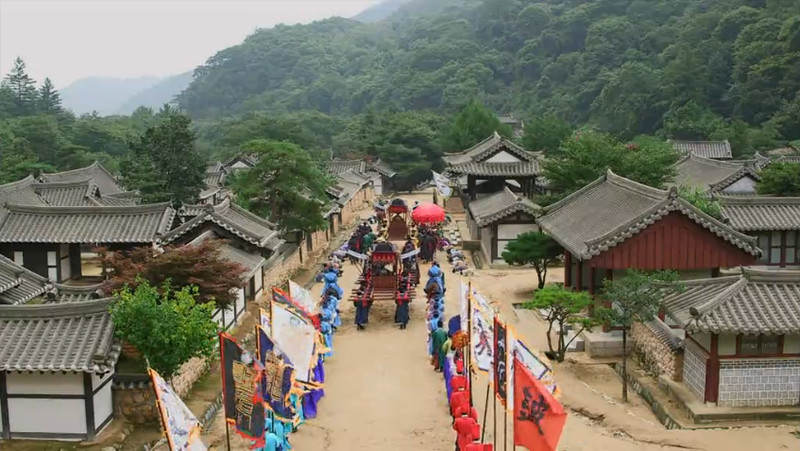 Dal Hyang eventually finds the location that Mi-ryeong is staying in and heads to the room she’s staying in. Dal Hyang enters the room after receiving permission to enter and the first thing he comes across is an undressed Mi-ryeong. Surprised and a bit uncomfortable, he finds it hard to focus and answer Mi-ryeong’s questions on why he is meeting her when Mi-ryeong isn’t fully dressed. She abides to his request to put on some clothes so while he waits, he looks around the room only to find the letter that Yoon Seo wrote to him back when they were younger lying on the desk! He becomes confused and bewildered because he had been told by Yoon Seo that she had burned the letter, why is the letter resting on the desk? And why is there another duplicate of the letter lying next to it? It turns out that this letter is the item that Yoon Seo had tried to find earlier, but was unsuccessful in doing so. She scrambles through all of the drawers in her room in search for the letter, but it is no where to be found (it’s because it’s in Mi-ryeong’s room!). YIKES! Maybe Dal Hyang shouldn’t have asked Mi-ryeong to put on some clothes because when she finishes dressing, she returns with a needle and stabs it in Dal Hyang’s neck, poisoning him (tsk tsk tsk. Probably the one thing that Dal Hyang will regret doing the most, haha). While he continually grows unstable and weak due to the poison, she goes off talking about Yoon Seo and the letter. She removes the needle from Dal Hyang’s neck before leaving, saying that she liked him enough to not poison him. Mi-ryeong gives Dal Hyang one piece of advice before leaving the room, saying: “You don’t have to be so loyal to the prince. He’s not worth putting your life on the line for.” Ooooohhhh. Woah woah woah woah. Things are gonna go down and I’m excited. When Dal Hyang becomes conscious again, he finds a dead undressed maid lying on the floor next to him. It turns out that she had been poisoned by a needle as well and as a result ended up dying. Dal Hyang takes the needle from her neck with him and goes to search for Yoon Seo’s letter but is unsuccessful in doing so since Mi-ryeong took it with her. When the Vice General approaches the room and threatens to enter, Dal Hyang panics and jumps out of the window since that is his only escape. Luckily Dal Hyang is out of sight by the time the Vice General enters and all that he sees is the dead maid lying on the floor. He informs the General about it so the two of them head to the scene to examine the body. Meanwhile, the King faces difficulties getting to the location that the Manchus are waiting at. Many of the citizens plead him to not greet them and one man even jumps out in front of the King to tell him his story of his sons who all got killed in their last war in hopes of persuading the King to change his mind. The King remains unaffected and demands to continue going, but along the way, becomes conflicted and a bit scared. He imagines the Manchus aiming their arrows at him while he can hear the cries and pleas of many of the citizens. The King awakens from his trance when he is notified by his servants that they have arrived at their destination. Meanwhile, General Yong Gol Dae and the Vice General are examining the dead body in the Vice General’s motel room. Since the King is arriving soon, General directs the Vice General to remove the body as soon as possible before anybody can see it. They also take notice of the window that was opened when the Vice General entered earlier. They conclude that a woman could not have jumped out of the window since it’s too high of a place. That leads us to finding out where our protagonist is who happens to be lying on the ground in the forest unconscious and injured. But somehow, in some way, he wakes up with just a few minor injuries here and there. Wow, that’s a miracle. You are very strong I see Park Dal Hyang. Back at Mohwaguam, the King demands to meet General Yong Gol Dae (who isn’t there at the moment because he had left to go examine the dead body in the room) only to hear that he is unavailable at the moment because something has popped up. This angers the King and he goes off on a rampage about how he’s tired of the way he’s been getting treated by the Manchus. Therefore, he orders all the military officers / soldiers to find and arrest Yong Gol Dae and then to bring him to the King so that the King can behead Yong Gol Dae’s head himself. Woah woah wow wow, the King is very brave isn’t he? A fight breaks out between the Joseon soldiers and the Manchus where the Joseon soldiers end up overtaking the Manchus. The King is careless and heads back to rest in his carriage, but his son tries to persuade him to take back what he said. In the end, this will cause an unnecessary war. But the King knows it himself and states that there is nothing he can do about it. It’s already too late. (Wow, so much for being king eh?). He heads back to the Palace and leaves the Prince behind. Meanwhile, the ongoing search for General Yong Gol Dae ensues. 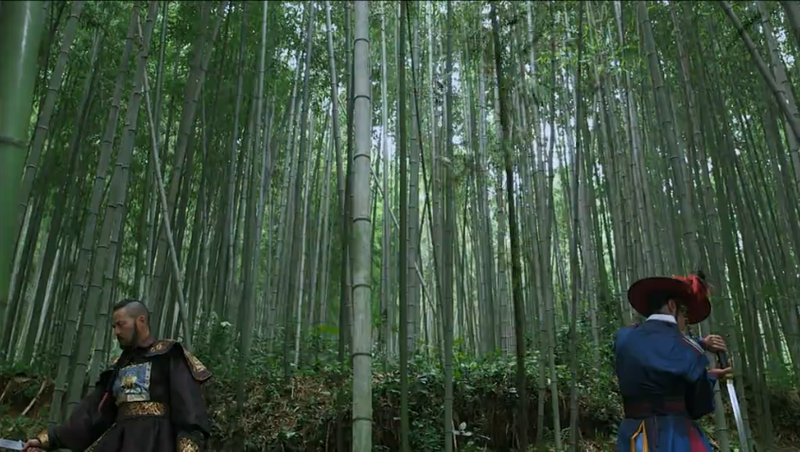 He manages to escape through the same window that Dal Hyang jumped out of and coincidentally comes across Dal Hyang who’s just walking about in the forest (-.-“). While they fight against each other (and talk to each other even though it’s no use because the both of them don’t understand each other lol), Sohyeon speaks to Seung-po and Min-seo on what their next plan is going to be. No matter what it takes, no matter how difficult it will be, they have to save and protect Yong Gol Dae from getting killed and beheaded. 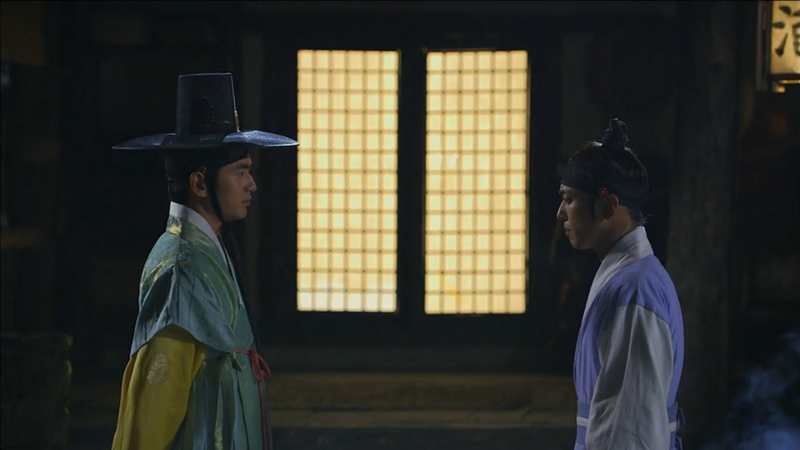 The episode ends with Dal Hyang and General Yong Gol Dae battling it out against each other.